Welcome to a smoothie adventure! If youâ€™ve chosen this book, itâ€™s likely that youâ€™re looking to bring more happiness into your life. Get ready to say hello to fabulous feelings! In Simple Green Smoothies you will learn everything you need to know about creating fresh, nutritious smoothies. With a sufficient number of recipes that will help improve your health and save money. â€¢ What a smoothie is? â€¢ How to create flavor combinations that are so delicious. â€¢ 3 days of easiest detoxify. â€¢Tips for selection, storage, and preparation of ingredients. â€¢ Answer to frequently asked question: smoothie or fresh? â€¢ Suggestions: how and when drinking a smoothie. â€¢ 15 fabulous smoothies for loss weight. No need to be a magician in the preparation of a liquid miracle. 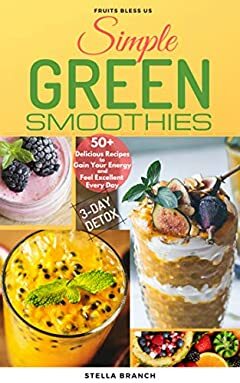 The Simple Green Smoothies will help you in creating a unique smoothie and takes you on an exciting journey to the land of fruits and vegetables. Just add these nutritious drinks to your daily life. And you can control your health every day!